This is a table my wife wanted for the new sun room. It is 36” diameter, 29” high and a 31” base circle. I planned on 6 segments but it meant some pretty wide pieces. I did not want to laminate boards to get the width as that would be additional seams so I went with 1” Baltic Birch plywood supplied by my buddy , LJ Doug Scott. Thanks Doug!! The segments are doweled and pocket screwed and glued together. I used dowels instead of biscuits because I want them to come right together and not have any “slide” during the gluing process. The corners had to be right on. The legs and the column supports are made from solid maple. I had tapped 1/4-20 holes in the bottom of the legs for levelers but decided to go with rectangular Delrin (4th photo) so it could be easily slid around on the carpet. They also cannot turn when moving the table. I could have adjusted the leg height with the glides but it came out flat right out of the chute so no need for adjustment. 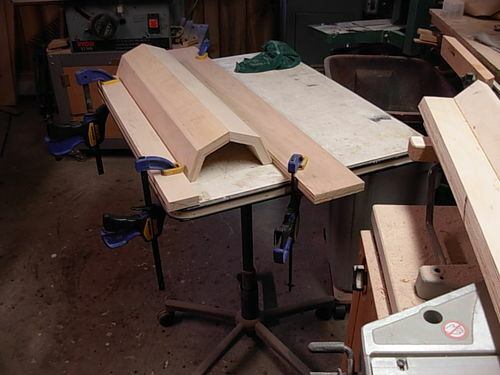 The last photo is in the white wood stage with the dovetail slots in the column to accept the legs . 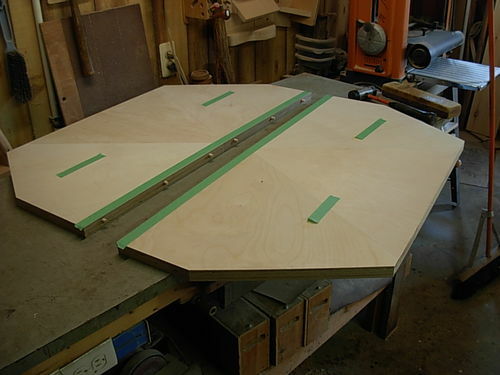 I did the legs on the router table and the column in the milling machine. 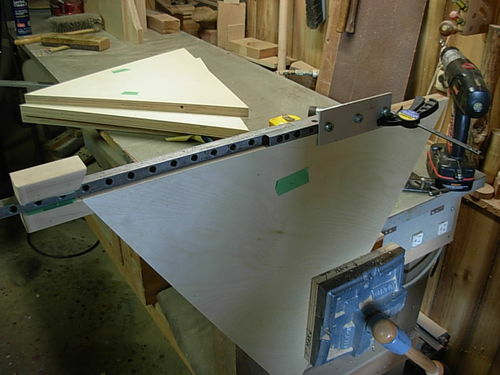 My rabbet sled was modified to hold the legs vertical for dovetailing No photos of that. The top was finished in that shot and ready for stain. The table is stained with Zar 120 ( Teak Natural) stain and finished with polyurethane. The top surface has 11 coats- 5 brushed on in the shop and 6 wiped on in the laundry room. The dust in the shop was giving me fits and took some heavy sanding between coats. I guess I should have shot it with lacquer. It would have been done 2 weeks earlier!! 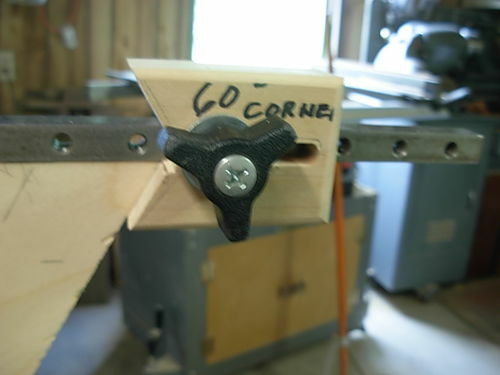 I used my doweling fixture and made a special end gauge to insure the location from the pointed corner. I had to make a long extension for the fixture to put the 6 dowels in the halves! Wow Jim…. That almost looks like a table….lol outstanding work as usual buddy. I especially like your clamping solution for the pedestal…. Nice!!! Hi Jim, Those Pedestal Tables always look nice. I never cease to be amazed how beautiful ply of any wood responds to a finish. 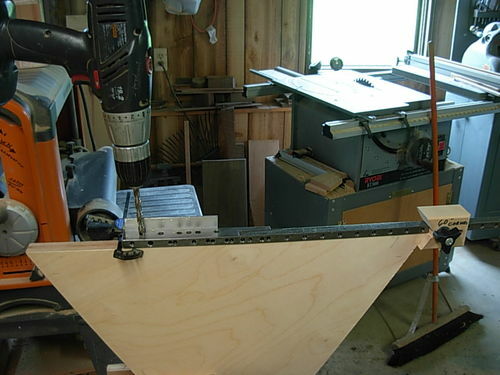 The doweling looks very precise, is there a trick in lining up the dowels/holes so as the timber itself remains level when the dowels are pushed home and glued? 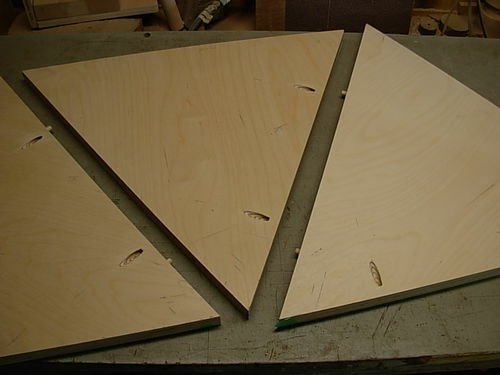 I have visions of attempting a dowel glue up and finding my joins and pieces are all out of whack. You have some good clamps there Jim, I have some on order which should arrive this week some time. Back to your table. What a beauty!!! It will be ideal for your Sun Room. Will you use it as a coffee type table or maybe put a potted plant on top? Those nylon bushes under the legs are good idea, easier on the floor. Jim what are those marks like birds feet on the end of the column in photo 3 & 6? Hi Cliff. 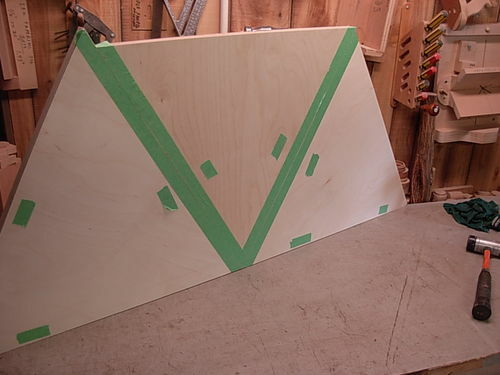 This will be a card table. We will buy 4 chairs for it pretty soon. I don’t make chairs. Those marks like bird feet are the pattern of pocket screws I used to attach the top and bottom to the column. The bottom ones are not evenly spaced because I had to make the screws miss the dovetail slots. Great looking table Jim, nicely worked out with the segments. Excellent building technik.I see you are not on summer vacation – constantly working! Thanks Bob, Bob, Tony and Ivan. I’m sure glad it is done!! Now I can use my shop again!! Hi Ivan. I’m retired so I’m always on vacation but making wood projects is not like work. It is a pure fun!! We do get away to the lake and to car shows all summer long ,too. Just got back from a show in Kentucky Headed for Washington State in a few weeks to see my son..
Next weekend is the Buckley Old Engine show….......never a dull moment!! Dang that is nice Jim. It is fun watching someone else figure out how to do it. I love the challenges of a build. What Mama wants, Mama gets! Great job Jim. Thanks for all the details!